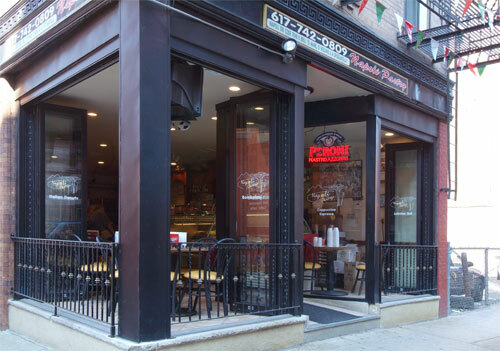 "Our Pacer entrances can be seen throughout Boston's North end where they give a real European sidewalk cafe feel to the restaurants in summer and close securely with insulated glass for winter comfort." Perfect for use in resort and tourist areas where restaurants and gift shops spill out onto the sidewalk, Pacer units ship across the US and can be seen as far west as Hawaii. The Pacer 450 End-fold works well as an entrance or window style opening. Door units glide smoothly on our top edge roller system (shown left) and are securely held in place with high strength pivots. These units may be used with or without a threshold. For added safety and security, Pacer Series entrances feature a hook-bolt lock. As an alternative, the End Fold units may have a single lever, 2-point locking system for simplicity and pleasing aesthetics. Three quarter diameter back to back pull handles are installed and the units are set up for 1/4” or 1” glazing. Featuring narrow or medium stile sliding, folding and fixed panel configurations, the Pacer Series 450 Window/wall is a perfect compliment to AGS’s standard flush glazed systems: both 2” x 4-1/2” Flush Glazed System for 1” glass and 1-3/4” x 4-1/2” System for 1/4” glass. 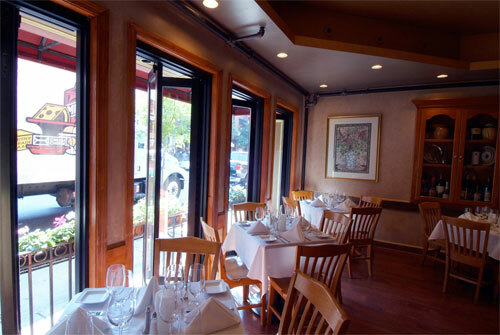 Our standard hardware is shown (right) for our bi-fold door. It provides two points of security with throw rods engaging vertically into the head and sill. 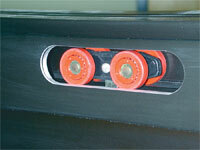 The handle rotates 90° from vertical to horizontal to operate the lock. As shown, it makes an attractive yet secure lock when used with one of our many available wood finishes. Be sure to check out our "Design Your Own Look" page for customization ideas. 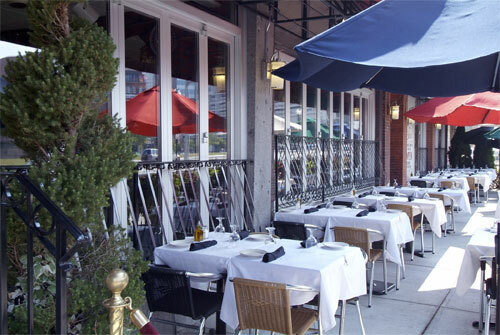 A sidewalk cafe and restaurant can merge when the window wall between them folds away (below). 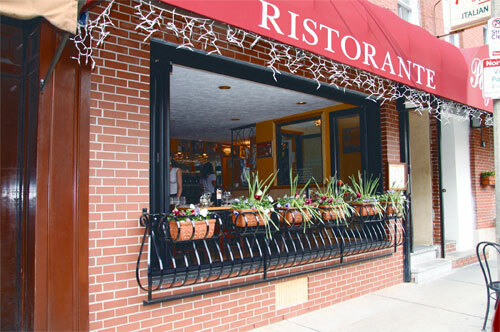 Shown below, a restaurant interior opens to the street. A pastry shop opens on 2 sides to the street .